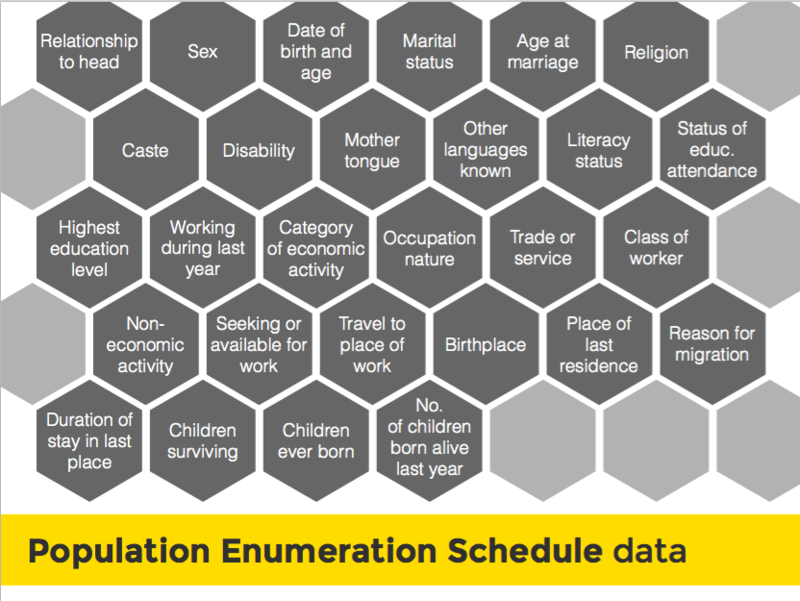 A Step-by-Step Guide to the 2011 Indian Census: Its Successes, Failures and Questions – Open Data Aha! This post is the third post in our Decoding Open Data series. The foundation of this series is our slideshare, which examines the open dataset and provides key insights and analytics about the 2011 Census. Read the previous posts here: We Bet You Don’t Know Why the Indian Census Was Created, Why Did It Take 4 Years to Prepare for the 2011 Census of India? Despite the proliferation of large scale surveys, the Indian Census remains one of the largest administrative exercises in the world. For the Census, enumerators fan out across India to visit every household and collect housing, social, demographic and economic data for every person in the country. Census data is used to create a comprehensive profile of the country, which can be used to drive better decisions and policies at all levels. In 2011, data was collected from 608,786 villages, 7742 towns, and 5767 tehsils across India’s 640 districts, using a total of 733,600 crore tons of paper. Despite the scale of this undertaking, the 2011 Census achieved a response rate over 97 to 98%. Such massive data collection certainly deserves further study. What steps did it take to effectively collect Census data in a systematic manner? How was this data processed and analysed? And what developments and issues arose during the 2011 Census? The 2011 Census officially began on 1 April 2010 with Phase 1 of the Census. 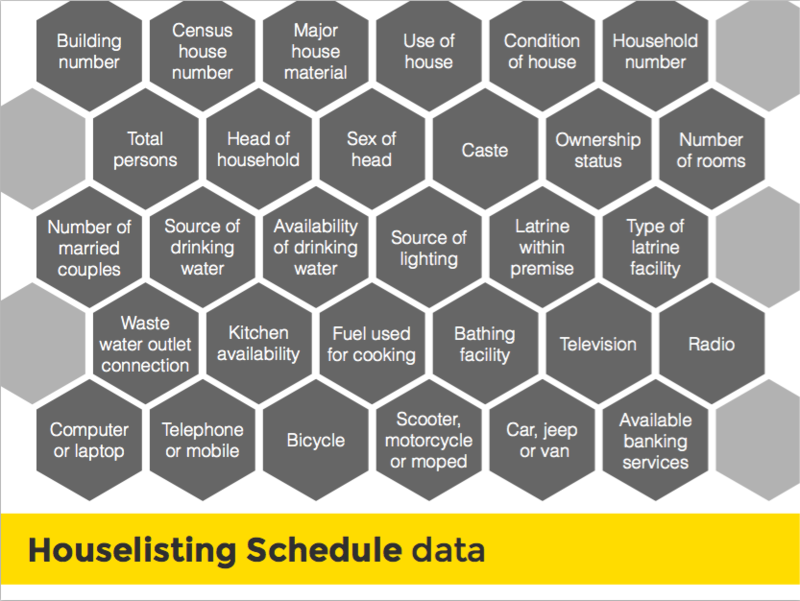 Phase 1 is the Houselisting and Housing Census, which collected data about every census house. Questions included the materials used in the house, condition of the house, number of rooms, water connection and availability, and basic information on the people living in that household. Each household was also tagged with a house number (distinct from the household’s address) used to track that household in Phase 2 of the Census. Phase 1 took 6 months and ended in September 2010. By identifying and mapping all households in the country, the Houselisting and Housing Census formed the base for data collection during the actual Census. Phase 2 of the Census was conducted from 9 February to 28 February 2011. During Phase 2, the government collects a set of demographic, social and economic data on every person in the country. In accordance with tradition, Phase 2 of the Census started by surveying the President, followed by the chief dignitaries (such as the state governor, chief minister, etc.) of each state. To collect information on 1.2 billion people in just 20 days, the government called on government employees to participate as enumerators. Teachers were the main source of enumerators, but anganwadi sevikas and employees from other government departments were also assigned census duty. As a result, some schools were closed during the Census. To account for all people in India, the Census devoted its last day (28 February 2011) to finding and enumerating the homeless, who had not been accounted for in the Houselisting and Housing Census. The Census underwent Phase 3 from 1 March to 5 March 2011. Called the Revision Round, Phase 3 accounted for any births, deaths, or migration that occurred up to 00:00 1 March 2011. Caste information was collected for the first time since 1931, following demands from several ruling coalition leaders like Lalu Prasad Yadav, Sharad Yadav and Mulayam Singh Yadav with the support of the BJP, Alkali Dal, Shiv Sena and Anna David Munnetra Kazhagam opposition parties. Disability information became more detailed and important. Disability questions were moved before mother tongue on the Census questionnaire, and a demarcation was made between mental retardation (which is inborn) and mental illness (which can be acquired later in life). In addition, the questionnaire asked for information on a wide range of specific disabilities, including visual, audible, speech, locomotor, mental retardation, mental ailments, multiple disabilities, with an option for “any other” to include disabilities that weren’t listed. Date of birth became a mandatory question. In rural areas where most people don’t know their birth dates, enumerators asked them to remember an event that happened close to their birth. India and Bangladesh conducted their first-ever joint census of areas along their border. “Third gender” was added as a separate category under gender. “Institutional household” was added to account for people living in hostels, jails, hospitals, etc. Processing all collected data used to be one of the major pain points of the Census, since Census data is filled on paper by hand. Through the 1991 Census, data processing used to take more than 5 years. This was reduced to 3 years in 2001. While this was an improvement, 3 years is still a significant amount of time. By the time the Census results came out, they were already out of date. This process was improved in 2011 with the introduction of Intelligent Character Recognition (ICR) technology. Starting in 2011, Census forms were scanned using high speed scanners, then the information on the forms was automatically read and digitised using ICR software. This change was a huge risk for the Census Office. Before 2011, the ICR technology had only been used by a few small countries; it was untested at the scale of the Indian Census. However, the risk was worth the reward. As the result of ICR tecnology, the period needed to process Census data dropped from 3 years to 1.5 years, and the cost and effort also dropped significantly. The 2011 Census faced several important issues around data accuracy and the enumerators’ experience. While issues are inevitable while working at this scale, it is essential to consider the issues so they can be properly addressed in the future. One major issue raised was that census enumerators did not necessarily ask all relevant questions. People reported that census enumerators filled questions about gender without actually asking the question. This became an issue for transgender people who might look outwardly like one gender but consider themselves the other gender. Even when these questions were asked, families could be hesitant to disclose sensitive or embarrassing information. For example, usually the head of the household answered Census questions for all people in the household. He might report someone as his son, even if that “son” actually considers herself a woman. The same issue arose around disability data. The Census added more detailed questions about disabilities, and even ran a campaign around accurately reporting disabilities. Yet, since disability is a taboo subject, households were often inclined to hide disabled family members when Census enumerators showed up. The result was a low, likely inaccurate, percentage of disabled persons in the country. Working at such a massive scale inevitably led to problems because of the number of people involved — 25.4 lakh people worked on the Census, 21 lakh of whom were enumerators. Three years after the Census, many teachers in Nagpur reported that they had not yet received their full salary. Census enumerators were supposed to receive 18,300 Rs. and supervisors 24,300 Rs. each. However, enumerators and supervisors had only received 8,300 and 12,300 Rs. respectively. An RTI query by Hemant Ganjre revealed that enumerators overall received less than half of the amount promised. By 2015, the rural development department of the Maharashtra government had dispersed 5.5 crore rupees for rural enumerators, but it had not yet sanctioned the 2.4 crore rupees required for enumerators and supervisors in Nagpur. In addition, many enumerators in Mumbai — home to Kamathipura, the largest red-light area in the world — reported discomfort with their work. The enumerators said that having to go to Kamathipura and visit brothels was “embarrassing”. Some anxious female enumerators brought their husbands, but their husbands were often mistaken for customers, which led to further embarrassment. Other enumerators asked for police protection, but this was refused since Census officials thought that prostitutes would be unlikely to speak in front of cops. Bombay Teen Challenge, an NGO in Mumbai, helped enumerators interact with people in Kamathipura, but enumerators still faced many problems with false information. Some women refused to give accurate information, reporting different names and ages from one day to the next. Another problem that arose was the prevalence of proxy enumerators in Andhra Pradesh, where enumerators outsourced their work to other people. In Hyderabad, the Times of India reported that an enumerator left his forms with a neighborhood’s watchman, promising to return in 4 days to collect the filled forms. In Vijayawada, teachers passed their Census forms off to their students, and some officials in Visakhapatnam passed off their forms to colleagues. The problem is that proxy enumerators were not properly trained, so the quality of the data they collected was generally low. While the state’s census director made trips to some districts to oversee the exercise, some observers say she turned a blind eye to issues with the enumerators. Ultimately the Indian Census was a valuable exercise. It is hard to survey even a thousand people, so successfully asking 28 questions to almost 1.2 billion people is certainly worth celebrating. The 2011 Census saw many improvements around its questions — especially in being more inclusive of the different disabilities, including the third gender as an option and allowing women to list themselves as separated. At the same time, the introduction of ICR technology indisputedly improved data processing time and quality. However, it is crucial for the Census to address its problems and keep improving. Since Census data is used to guide almost every government policy, programme and scheme, data accuracy is crucial. Sensitive questions are always difficult, but it is crucial to figure out how to accurately measure sensitive topics like gender and disability. At the same time, enumerators must be held to high standards and be paid adequately, which will help to ensure that they take their job seriously. Want to dig into the Census data yourself? Sign up to get an early access pass for our excel plugin, where you can access open data directly from Excel. No more finding and downloading CSV files. The post A Step-by-Step Guide to the 2011 Census: Its Successes, Failures and Questions appeared first on SocialCops Blog.